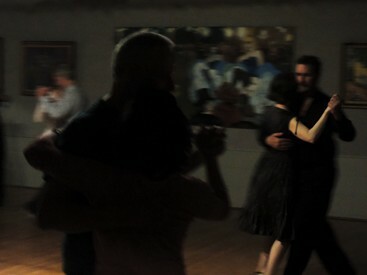 Born along the banks of Río de la Plata more than a century ago, ARGENTINE TANGO is among the most dynamic and intoxicating dances ever created. 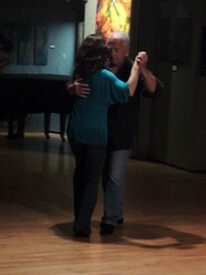 In its social form, as we explore it, TANGO is completely improvised  two bodies, intimately connected, co-creating a unique and spontaneous expression in time and space. No prior dance experience is necessary  just a willingness to open yourself to this potent "kinetic language" and the distinctive music that drives it, and a desire to begin exploring the many possibilities that TANGO has to offer ... subtle, complex, elegant and profound. From US 101 in Ventura, take CA 33 north toward Ojai. Keep going straight as CA 150 joins CA 33, then swings east to take you into Ojai. Stay on CA 150. The "center of town" is the stop light at Signal Street  you'll see the Post Office on the SE corner, with its iconic bell tower. 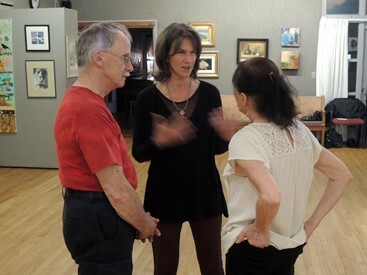 Continue east approximately 0.1 miles, past Libbey Park, and turn right/south onto South Montgomery  the Ojai Art Center is half a block down, on your right. 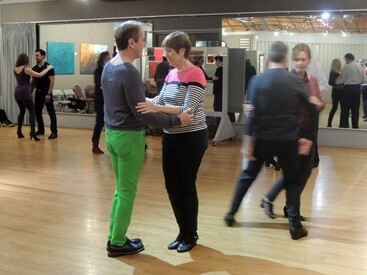 The Monday night workshops, prácticas and social dancing in Ojai give local and visiting dancers several ways to meet, learn, practice and explore the Argentine tango. 1st + 3rd Mondays, 7:00 - 8:00 p.m. 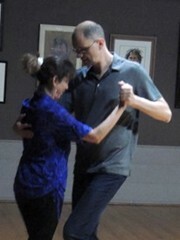 Since their earliest beginnings back in 2004, the Monday night Drop-In Workshops in Ojai have focused on the "core principles" of Argentine tango  those fundamental techniques, concepts, elements, ideas, relationships and variables that make this exceptional dance possible. Topics and issues will vary from session to session, allowing dancers to build up skill, confidence and experience at their own pace. Dancers are welcome to stop by anytime  whether to take a single Workshop, to join us for several sessions, or to attend regularly on 1st + 3rd Mondays. Consistent with our "All-Levels" approach, no prior dance experience is necessary. 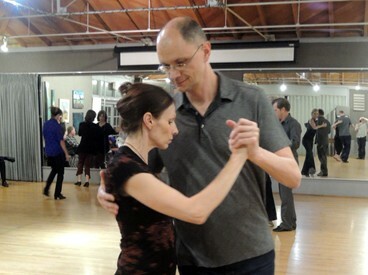 By way of our emphasis on Core Principles, newer dancers will find that the various concepts + examples presented are readily accessible and immediately useful on the improvised social dance floor. 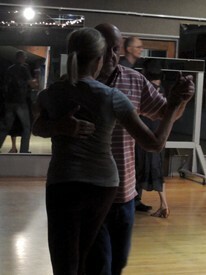 Not only are Core Principles universally applicable in all tango situations, they have also proven both durable and valuable over time  providing dancers with a solid foundation for their longterm engagement with the dance, as well as amplifying + augmenting any other tango classes, study, practice and investigations they might happen to pursue. Advanced beginners, intermediate dancers, and those interested in exploring non-traditional roles are also welcome to attend. 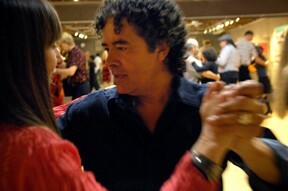 Since a strong grasp of Core Principles is widely acknowledged as the key to all of tango's more complex situations and possibilities, experienced dancers recognize that regular review and ongoing refinement of these basic skills  and a richer, more intimate understanding of both "sides" or roles involved  are among the best ways to improve the overall fluency, creativity, depth and range of their dancing. 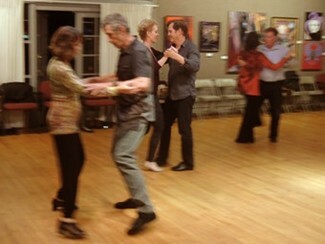 In order to accommodate the Open Prácticas that follow, we will do our best to begin and end promptly  to enjoy a full hour of Workshop, please be ready to dance at 7:00 p.m.
Monday night tango Workshop takes place in the Gallery at the Ojai Art Center, and are open to all dancers on a "drop-in" basis. There is no need to sign up in advance, or to come with a partner. The cost of each one-hour Workshop is $10 per person. 1st + 3rd Mondays, 8:00 - 9:00 p.m. The Open Prácticas are "practice sessions" rather than formal workshops or classes. 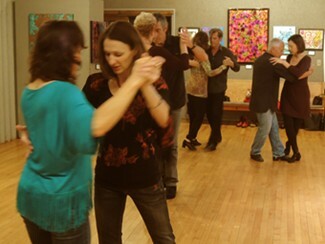 Here the focus is on providing an open floor and a selection of music so that dancers who've had some exposure to tango can practice and apply what they know, learn from each other, experiment and try new things, get extra help, and find or change partners. During this, we'll be on hand to supervise, answer questions, and play music ... but we will not aim to present new material in any organized fashion. Any level of skill or experience is appropriate and welcome at the Práctica  including active and seasoned dancers, beginners just starting their tango explorations, and prodigal tangueros looking for a way to shake out the cobwebs and reconnect with what they know. 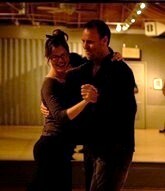 Monday night Prácticas are open to all local and visiting tango dancers on a "drop-in" basis. There is no need to sign up in advance, or to come with a partner. Admission is by donation  to help us cover the cost of the dance floor. 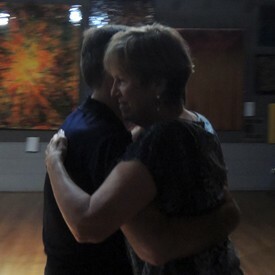 1st + 3rd Mondays, 9:00 - 10:00 p.m.
After Monday night's Workshop and Práctica, consider staying on as we dim the lights and shift into the social dancing part of the evening, Ojai's renowned "Tango Incident." 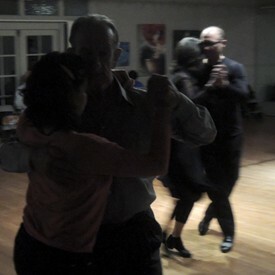 Formerly held in a nearby restaurant, the "Incident" is among the most low-key, friendly and welcoming tango experiences you are likely to find. 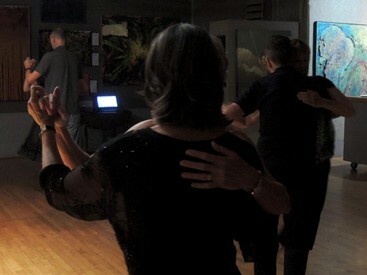 The generous maple floor of the Art Center Gallery means that all dancers will have plenty of room to continue exploring, developing and celebrating tango in the ways that most appeal to them  whether they are"raw beginners" still working with new ideas from the Workshop, or seasoned tangueros/as who simply want to wrap themselves in a warm embrace and float their way toward "tango bliss." For those looking for something to eat or drink along with their dancing, we have the Art Center's permission to "BYO" ... so feel free to catch a meal at one of Ojai's nearby bistros and then come back, order in your favorite delivery or take out, or "brown bag" it by bringing something tasty from home. 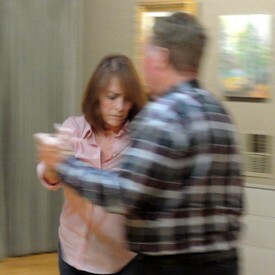 The "Tango Incident" continues until 10:00 p.m., rounding out three full hours of Monday night dancing in Ojai. We play a wide variety of music for tango dancers throughout the evening, ranging from the familiar and beloved classics of tango's "Golden Age" to the fresh and provocative sounds of today's tango musicians. Workshop sessions typically feature tango standards and other music with the kind of clear beat and even tempo that is most appropriate for newer dancers. During the Práctica, the sound can become more eclectic  usually a wider mix of tangos, milongas and valses reflecting many styles, tempos, moods and approaches, including fresh interpretations of familiar music and selected newer pieces. If a more "traditional" mood strikes us, we may lean toward classics from our favorite "Golden Age" orquestas  the kinds of tangos, milongas and valses that dancers are likely to hear played in traditional clubs and venues throughout the world. Whereas, if a more "contemporary" feeling takes hold, we may delve into today's rich "neo-tango" sound and sensibility  electronic and acoustic recordings of modern compositions, innovative tangos with a non-traditional edge and perspective, and some of the latest experiments in fusion, crossover and "alternative" sounds that are helping drive tango's ongoing evolution and transformation into a truly global art form. If you'd like to dance with us, please remember to bring a suitable pair of shoes. Whether in class, at the práctica, or dancing socially, choose shoes with leather or other hard soles that slide easily and won't leave marks on a fine hardwood floor. 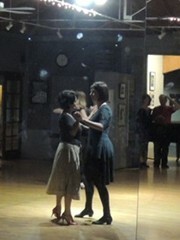 Since many tango elements involve a pivot of some kind, shoes with softer or rubber soles that tend to "grip" the floor will make dancing much harder than it should be, and are usually a poor choice. And wide, heavy or clunky shoes are not as good as shoes with a narrower profile that fits closer to your foot. In all situations, shoes with laces or secure straps are recommended for tango. 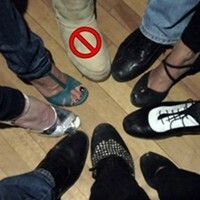 It's best to avoid gym shoes, loafers, mules, boots, clogs, loose sandals, flip-flops, and other similar footwear. Although heels are customary for women, flat shoes are fine too.